Home Community News New Gear, More Combat and More! Fixed some issues with NPC spawning. Fixed typing ‘<‘ & ‘>’ in game. Fixed a bug with Autocasting. Fixed a bug with Clan Chat interfaces and Party Chat interfaces. Fixed a bug with the Raid loot shower. Fixed a bug with Profile views not properly counting. Fixed a bug with the like and dislike counting. not properly working for the Profile viewer. Fixed a bug with the players online interface cutting off text on some longer usernames. Red Graceful Gloves now require 1 attack to wear instead of 60. Burnt Anglerfish are now stackable. Monks are no longer aggressive. 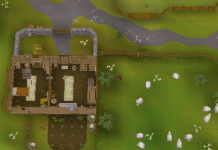 The Kalphite queen area is now Multi-Combat. Added a couple of alerts to let you know you can’t open the Price Checker instead of doing nothing. Added a description to all of the Party Hats, Santa’s and Halloween Masks. The maximum prestige is now 25 per skill. Shears, Rake, Seed dibber, and gardening trowel were removed from the ironman general store as they are in the Farming Store. Spades will remain in the ironman general shop. Jugs of Water were added into the Ironman general store. For non-ironman, you can find Jugs of Water in the skilling store AND the General Store. Grapes will continue to remain out of stores. They can currently be obtained by killing various NPCs throughout the game (i.e. Zulrah). The security guard on Donator Island has been moved to no londer be ON the bank booth. The random Barbarian at Donator Zone has been removed. Removed duplicated Black Knight Fortress guards. Changed the ID of Spiders in Lumbridge to the correct ID. Removed Giant Spiders from Lumbridge. Changed the “Soldiers” located near the Warriors Guild to the correct ID. Added Dark Wizard (lvl 7) combat definitions. Replaced the Dark Wizard at Draynor with the correct ID. Added Dark Wizards to the circle next to Varrock. Removed H.A.M huards from the Dwarven mine. Nerfed White Knights and significantly nerfed Icefiends. Previous article1 Year of Uptime!